Vienna is a city of Imperial grandeur. One senses a confidence and feeling of awe in its numerous magnificent public buildings and rich musical, operatic and theatrical heritage. 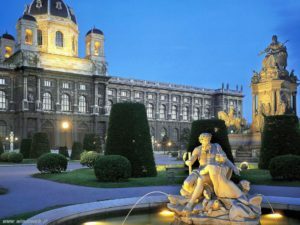 The Kunsthistorisches Museum is one of the most magnificent art galleries in the world with its superb collections of Brueghels, Giorgiones, Velazquez, Titians, the bizarre works of Arcimboldo and the notorious Cellini gold salt cellar. The Secession building is just one of many examples of stunning Art Nouveau architecture and design, and the works of Gustav Klimt demonstrate how, in the early 20th century, painters protested against the formalities of High Art. No visit to Vienna would be complete without seeing the 18th century palace of Schönbrunn, just outside the city. A visit to Vienna, this ‘city of dreams’, should be made at least once in a lifetime! Centrally located Hotel Regina****, Bed and Breakfast tariff in twin-share room with private facilities. £615 inclusive of tuition, airport transfers (airport transfers are only available for the Siragusa Tours Ltd nominated flight), accommodation and breakfast. Ca. £200 scheduled flight to Vienne. Note that this is an estimate. Once the tour is viable we will contact you with details of the ‘nominated flight’. You can decide whether you wish to make independent arrangements (people from the North may wish to use a Northern airport) or whether you wish to be booked on the group flight. Please note that when we contact you with fares they are usually only valid for the day and may be higher (or lower) the next day. On the booking form you have the option to authorise us to issue flights if we can’t get hold of you. Mary Hawkins, BA (Hon) and NFF, Cert Ed, is an experienced lecturer and art historian. She has worked for the Open University, the Universities of Cambridge and Essex and the WEA. She has led numerous studytours to Italy, Belgium, Holland, France, Austria, Spain, Portugal, Hungary , the Czech Republic and St Petersburg. am Art Nouveau – The Secession Building, the Majolikahaus and environs.